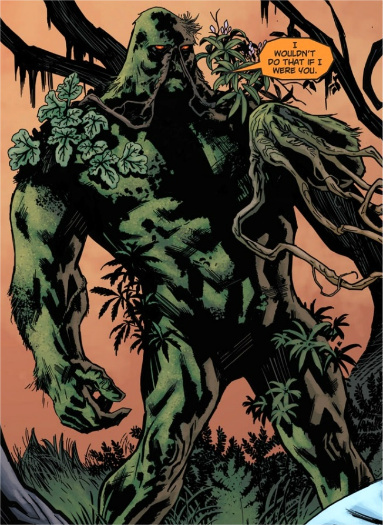 Plant Growth: Swamp Thing often uses his skills to create useful plants, including giant Venus flytraps and strangling vines. She has the ability to cause plant life to grow at an Sh-X rate. Psychogenic Tubers: creates Am intensity illusion on individuals who eat the tuber; the illusion perceived is keyed to the character of the consumer. If the consumer's mind is filled with ugly thoughts, the tuber will magnify those, provoking living nightmares. If the person's mind is in a bright or pleasurable state, the visions are rich and harmonious. Swamp Thing can easily enter the mind of someone who has eaten the root and can then produce an ecstatic, transcendent experience by allowing the person's consciousness to enter the Green.